First time I've seen this one. 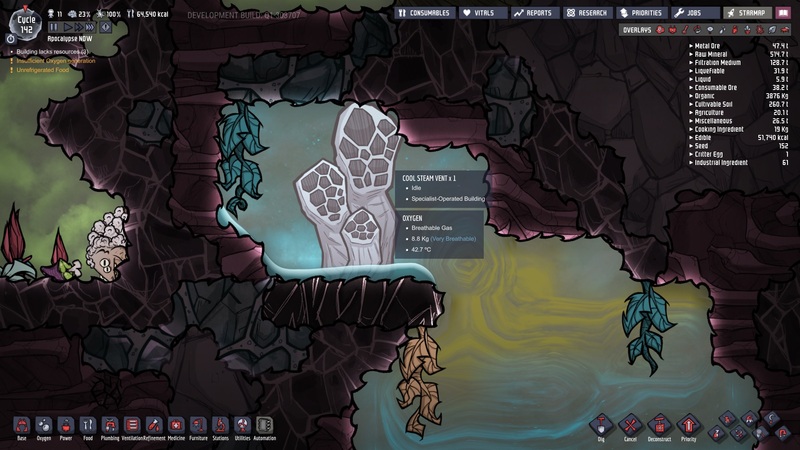 I have a COOL steam vent in my current world, but in all ways temperature, it's acting like a HOT steam vent. It doesn't seem to be yielding any new water either, sadly. Save game and pics attached. Seems to have been part of the world generation, not my actions. If you planned on having water emitted by this vent, you're wrong. As it's name said, it emits cool steam. It emits steam, so, it's "boiled water" above 100 °C. But it's not like the hot steam vent that emits steam at 500 °C. So the steam is cooler with this vent than with the hot steam vent. You must also remember that every vents can't emit new gas if the surronding pressure is above 5 kg (if I'm not wrong). Your first screen show 8,8 kg of oxygen around the vent. So each time it trys to emit steam, it's blocke by overpressure. About the second screen, except oil reservoirs, all vents, geyser, and volcanos appears at 99 °C. But none seems to interact with the surrounding. what Gwido said. if you included the screen showing the actual stats of the vent (the one that shows in the bottom right corner) we could be more specific but it probably says it emits a 230f or 100c, and 8k is much too high for any venting.